Nootka Rose (Rosa nutkana) - As the buds of this rose open, so can your heart open and blossom Divine Love and Gratitude into your life through aligning your heart chakra with the World Heart and the Universal Heart. I AM awakening of Divine Love and Gratitude in daily life. Nootka Rose is a native to the North American Pacific Northwest. It grows 3-9 feet tall and has 5-petaled fragrant pink flowers in early summer. Its large round red-orange hips are high in vitamin C and can be used in teas. Some indigenous people ate the tender shoots in spring and placed rose leaves in cooking pots to keep the food from burning and for flavor. 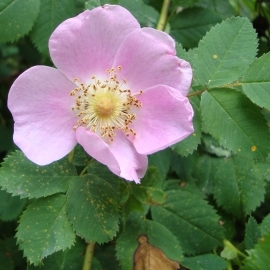 Nootka rose grows in moist soils in sunny locations and provides both food and shelter for birds and beneficial insects. Feeling that your heart is closed, shut down, protected. This could manifest emotionally as feeling depressed, anxious or detached. Physically, even though you have a strong heart, you might find yourself having symptoms like minor heart palpitations. Spiritually, when your heart chakra is out of alignment with higher energies, you may feel lost or disconnected, without a heartfelt religious or spiritual path. Note: If you have a physical heart problem, this essence may be too strong. We suggest using Lady’s Mantle Flower Essence instead. Nootka Rose Flower Essence opens, balances and connects your heart chakra with the World Heart and the Universal Heart. The World Heart emanates from the collective heart consciousness of all living Beings seen and unseen that live on Earth. This includes humans, animals, plants, Nature and Elemental Beings and the Earth. The Universal Heart emanates from all directions of space and time, from All-That–Is. Nootka Rose Essence clears your heart chakra through the inner and outer 9 dimensions of Earth’s energy layers to connect your personal heart with these higher energies. This connects you with Divine Love and enriches your relationships with loved ones, friends, your Self, Nature and All Beings. Nootka Rose Flower Essence also carries an orientation toward gratitude because it points toward the heart space from which gratitude wells up. Gratitude is not something you can decide to feel. However, intention can assist because it is also a pointer toward the heart space from which gratitude flows. Gratitude bridges dimensions and, like love, it is the “stuff” that matter “hangs” on. Focus your intention on opening your heart and living life with gratitude! This essence was made by the no-pick method. While the essence was being made, crystals of amber, drusy quartz, garnet, icosahedron quartz, morganite, nirvana quartz, pink cobalto calcite, pink opaque calcite, rhodochrosite, rhodonite, rose quartz, and ruby were placed among the plants with the storage (mother) bottles. The sun acts as a transformer to step down spiritual energies from higher dimensions. While the essence was being made, Amber acted as a lens to receive and focus sunlight for this purpose. Drusy Quartz crystals help to energize and stabilize your subtle bodies. Garnet is a stone of devotion that aligns the emotional and intellectual bodies with the “All That Is” and sets ablaze the inner fires of self-confidence, creativity and reflection. Icosahedron cut quartz has 20 (5X4) equilateral sides. It is a bridge between the 5th Dimension - the entry into the unified Spiritual realms - and the 4 cardinal directions (N, S, E, W) on Earth. Morganite opens your heart to the level of Cosmic Love that is all around us. It strengthens the heart’s energy field and teaches protection through love instead of fear. Nirvana Quartz brings your heart and mind into synergistic communication, and promotes inner silence. It attunes you to the human evolutionary process, inner radiance, and ability to overcome difficult processes with beauty and strength. Pink cobalto calcite is a stone of love patience and gentleness. It embodies deep compassion, emotional healing and joy, while balancing your feeling-oriented and action-oriented aspects. Pink opaque calcite assists you to gently release old emotional patterns that you have outgrown while supporting and uplifting your heart. Rhodochrosite gently aids with healing past wounds, rediscovering self-love and embracing joy with a courageous heart. Rhodonite carries the qualities of love, compassion, and generosity. It supports you to recognize and clarify your gifts, and to use them for the highest good in service to others and our Mother Earth. Rose Quartz encourages gentleness, emotional healing, and uniting with the Divine; it shifts your body from a stress-based physiology to a higher frequency Love-based physiology. Ruby increases your life force, courage, passion and enthusiasm for life, and helps you be lovingly grounded in your physical body. The actions of the crystals inform the way this flower essence seats into the physical body. While the Nootka Rose Flower Essence was being made, imprints of rattle and spirit song coming through Diana’s voice were infused into the essence.